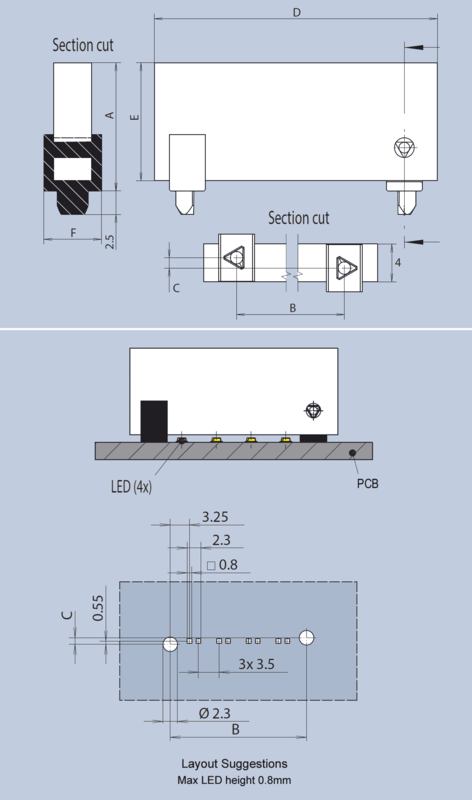 The newly developed M-CUT Solid Strip Light Guide is based on MENTOR-specified PMMA sheet and is designed for use with LEDs of type 0603 or smaller. It is used for homogeneous backlighting of cosmetic/indicator lighting strips as well as illuminated text signs. The light guide is held in place on the printed circuit board via two press-in lugs. Measurements B, D and E can be adjusted to the customers’ requirements. Individual 2D free geometrical forms are also possible.